Johnson & Johnson Innovation has an ongoing commitment to global pandemic preparedness efforts, as one of the few innovative healthcare companies in the world today that is actively engaged across multiple disease areas and approaches that are central to this challenge. A 2016 United Nations reportconcluded that, “The world remains ill-prepared to address the threat posed by epidemics,” urging action ahead of future pandemics to avoid devastating consequences. Epidemics are not only possible, but probable, with four in recent memory including the Ebola virus in West Africa. The same UN study points to mathematical modelling by the Bill and Melinda Gates Foundation which shows that a virulent strain of an airborne influenza virus could spread to all major global capitals within 60 days and kill more than 33 million people within 250 days. Traditional respiratory protective devices were designed for use in occupational settings and are prohibitively expensive for global adoption. Disposable versions, such as N95 respirators, are only available for adults, must be fit-tested to ensure proper functioning, and are uncomfortable to wear. Just how big of a problem is this? Given an outbreak of a novel or newly emerging respiratory disease, respiratory protection may be a crucial measure to protect healthcare workers and the general public. Yet, demand for such products in influenza or other respiratory disease pandemic would far exceed worldwide supply. Yet, decades have passed without a significant change to design. Together, we have the power to prevent needless suffering and start saving more lives by improving respiratory safety for everyone around the world. Biomedical Advanced Research and Development Authority (BARDA), part of the U.S. Department of Health and Human Services (HHS) Office of the Assistant Secretary for Preparedness and Response, was established to aid in securing our nation from chemical, biological, radiological, and nuclear (CBRN) threats, as well as from pandemic influenza (PI) and emerging infectious diseases (EID). BARDA supports the transition of medical countermeasures such as vaccines, drugs, and diagnostics from research through advanced development towards consideration for approval by the FDA and inclusion into the Strategic National Stockpile. BARDA’s support includes funding, technical assistance and core services. 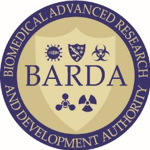 To date, BARDA has supported 42 FDA approvals for 38 unique products addressing CBRN, PI, and EID threats. Our mission is accomplished through successful public-private partnerships with industry to share risk, improve efficiency and accelerate development all while sustaining a marketplace that guarantees continued access to the vaccines, therapeutics, diagnostics, and other medical products that are vital to our national health security. For more information about BARDA, please visit https://www.phe.gov/about/bardaor follow @BARDA, @phegov. At Johnson & Johnson, we believe good health is the foundation of vibrant lives, thriving communities and forward progress. That’s why for more than 130 years, we have aimed to keep people well at every age and every stage of life. Today, as the world’s largest and most broadly-based healthcare company, we are committed to using our reach and size for good. We strive to improve access and affordability, create healthier communities, and put a healthy mind, body and environment within reach of everyone, everywhere. We are blending our heart, science and ingenuity to profoundly change the trajectory of health for humanity. Make sure your browser is up to date and accepting cookies. You can contact customer service at https://jnj-quickfire.smapply.io if you are having technical difficulties as well. Is it okay if some of the information I submit is confidential?